This timeline is a result of the generous contribution of Christie Romero and Barbara Talbott of their ‘Collectors Timeline’ to the AJU. The content of this timeline is subject to their copyright. Badarian culture in Egypt (c. 4500BC to 3250BC). Domestication of animals. Sedentary settlements. Social differentiation by burying prominent people in different areas of cemeteries. Invention of the wheel (circa 5000BC), presumably first for pottery purposes. 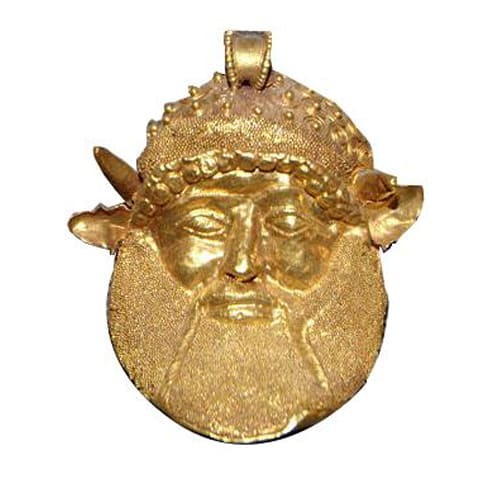 The ancient Thracian civilization produces the oldest worked-gold objects. They were discovered at a burial site in Varna, Bulgaria. Badarian Culture in Egypt starts using alluvial gold and manufactures glazed steatite beads. 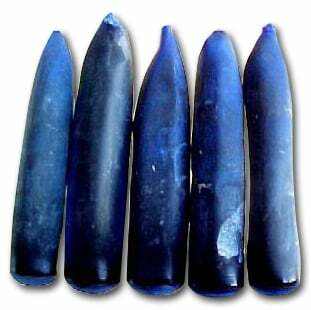 Naqada culture in Southern Egypt import obsidian from Ethiopia for tools. 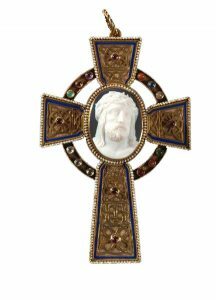 Jewelry made of gold, lapis, and ivory. The Naqada culture starts using symbols. Dynastic period in Egypt; King Meni unifies Upper and Lower Egypt. Dynastic periods in Sumer (2900BC-2334BC), Early Bronze Age in Sumer. Lapis lazuli, carnelian, turquoise, green feldspar (amazonite) used by the Egyptians. Great Pyramid of Gizeh (2560 BC) built. Minoan goldsmiths use foilbacked stones in their jewelry. Jet is mined in England. 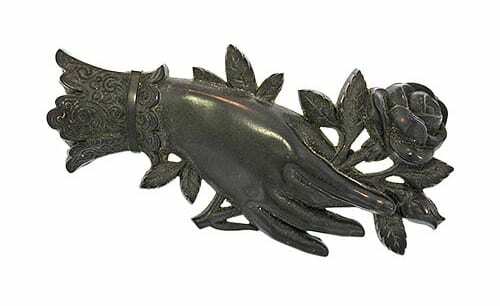 Art of lost wax casting developed in Near East. Jadeite in use by the Olmecs of Mexico. Iron hand tools – e.g., chisels, saws, awls, hammers, pliers – invented during the early Iron Age. Etruscans bury the ashes of their dead with grave gifts, Fibulas and armillas are amongst them. First electrum coins used in Lydia (Anatolia, Turkey) Amber used by the Etruscans. 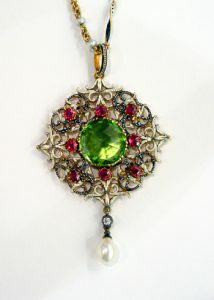 First documented use of red garnets and emeralds by Greeks. Greek Theophrastus (c.372-287 BC) compiles oldest surviving mineralogy text. 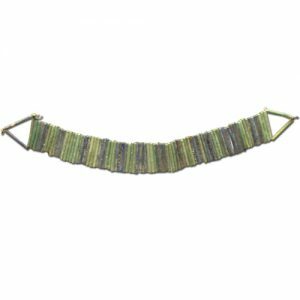 Fibulas are worn by Romans. Armillas are given to Roman soldiers as a military decoration. Tourmaline curvette cameo of Alexander the Great, originating in India, carved 3rd or 2nd C BC. Clay furnaces and blowpipes used to cast gold, alloy it with silver in Peru and Ecuador. 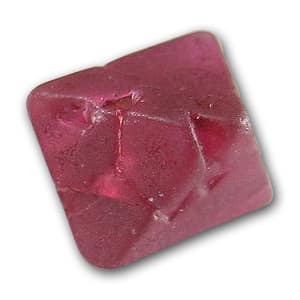 Earliest ornamental use of red spinel in Kabul Afghanistan, also used by Romans; blue spinel found in England in the Roman period, 51 BC-400 AD. The Vesuvius eruption. Pompeii and Herculaneum are buried in ashes and debris, Pliny the Elder dies, being too close of a witness of the eruption. Earliest known champlevé enamels, from Sudan. Cat’s eye chrysoberyl known in Rome, forgotten in the West until end of 19th C.
Germanic tribes invade the Roman Empire, the Migration period starts. Byzantine Emperor Justinian takes up laws regulating the wearing and usage of jewelry in a new set of laws, later to be called the Justinian Code. The San Vitale is completed in Ravenna. The prophet Muhammad is born, by the end of his life in 632 a large Islamic state has been established. Earliest evidence of metal drawplate usage in the Western world. King Raedwald of East Anglia receives a burial at Sutton Hoo with extraordinary jewelry by his side. Charles the Great is crowned Emperor. 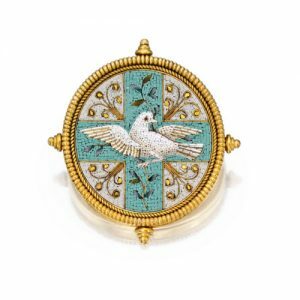 Cloisonné enamel finds its way into the workshops of Byzantine goldsmiths. In choosing a court style Charles picks the Romanesque style after Byzantine example. The crowning of Otto I marks the beginning of the Holy Roman Empire. The first crusade is launched. The loot of the first crusade containing incredible amounts of precious stones and gold is transported from the Holy Land to Northern Europe. 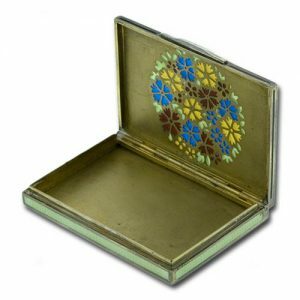 A distinct Arabic style emerges in jewelry of the Islamic world. The goldsmiths of London start a guild. Laws regulating the wearing of jewelry are instated in Aragon. First record of The Horner’s Co., London. The Gothic style starts to influence jewelry. Earliest evidence of diamond cutting (the point cut) in Venice. Ferronieres come into fashion during the 15th century. 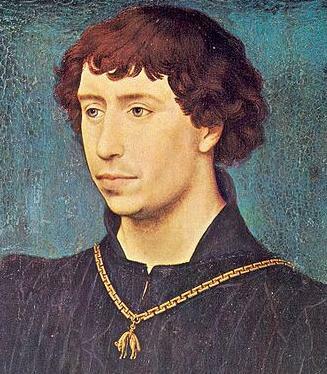 Charles the Bold, Duke of Burgundy is born (dies 1477). He is believed to have owned the Florentine Diamond. The first French cut diamonds are cut during the 15th century. 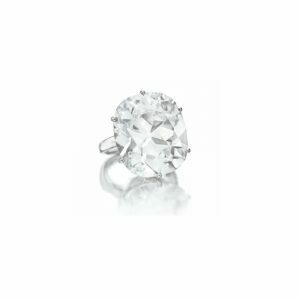 1st diamond engagement ring given to Mary of Burgundy by Emperor Maximilian I.
Leonardo da Vinci designs a rolling mill. Rose cuts for diamonds begin to appear. Benvenuto Cellini is born in Italy, describes plique à jour process in ‘Treatises’ in 1568. Probierbüchlein (Little Book of Assays) published, becomes important guide to assaying of metals. The first mention of the Agra Diamond in history. Spanish conquistadores send Colombian emeralds back to Spain. Arabesque style becomes popular in Renaissance scroll work. Spanish conquistadores find platinum in South America. First European lab for smelting ores to test for gold. 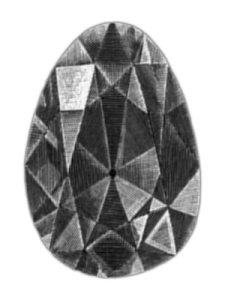 Silver found in the New World on Roanoke Island, VA; settlement evacuated 1586.
he Beau Sancy diamond is first mentioned in history. Colorless zircons mined in France. Human hair first worn in memorial jewels. The Baroque Period starts. The Tower (London) records from this year show the Sancy Diamond being purchased by King James I of Britain. 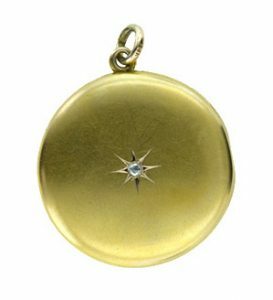 Jean Baptiste Tavernier starts his journey that brings him to Golconda, during the rest of his life he visits the area several times, bringing back diamonds of all sizes like the Le Grand Condé, the Tavernier Blue and many others. 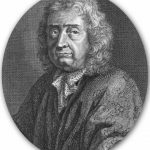 Jean Berain is born (dies 1711). First record of goldstone (aventurine glass) in Murano Italy. 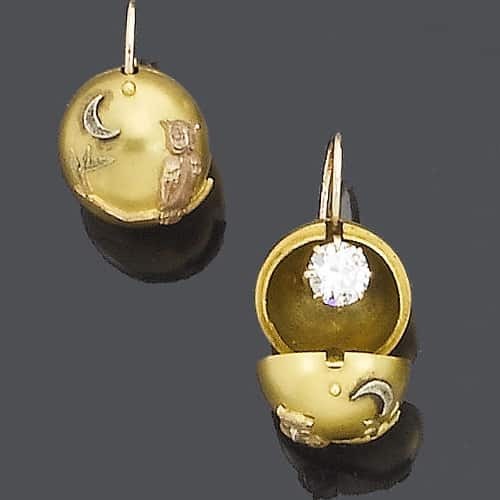 Earliest known use of silver-topped yellow gold for diamonds. 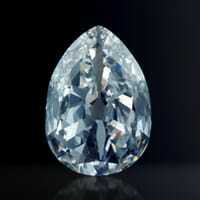 Great Mogul diamond is discovered in India (c.). Mary Stuart is born, later the Queen of England, Mary II, the first documented owner of the Holland diamond. Jean Baptiste Tavernier sells the Tavernier Blue to Louis XIV. 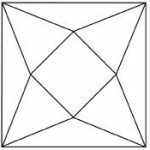 Flint glass (high lead content) developed by Englishman George Ravenscroft. En tremblant settings appear. Edict of Nantes revoked by Louis XIV. 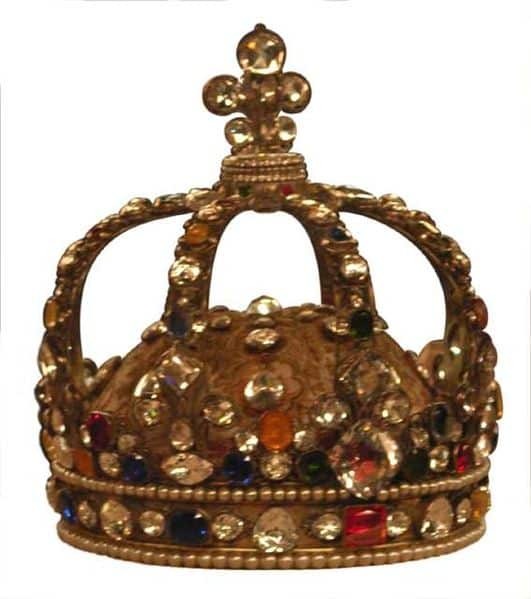 The Hortensia Diamond is mentioned in an inventory of the French Crown Jewels of Louis XIV. 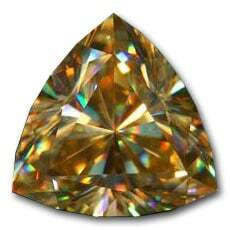 The Peruzzi cut, early version of 58-facet (square) brilliant, is developed. Christopher Pinchbeck develops an alloy of copper and zinc. The Dresden Green (world’s largest green diamond) first reported in “The London Post Boy”. Robert Adam is born (dies 1792). Johann Wolfgang von Goethe is born in Germany (dies in 1832). Giacomo Raffaelli is born in Italy (dies 1836). George III becomes King of Britain. 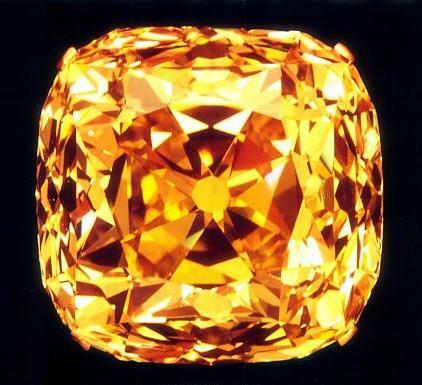 Eugénie diamond is discovered in Brazil. Lava cameos carved in Italy for tourists visiting Pompeii ruins. James Tassie develops vitreous glass paste for ‘cameos‘. 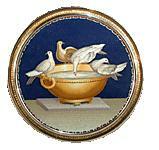 Josiah Wedgwood introduces fine ceramic known as jasperware in plaques with relief decoration resembling cameos, mounted in cut steel, manufactured by Matthew Boulton beginning in 1773. 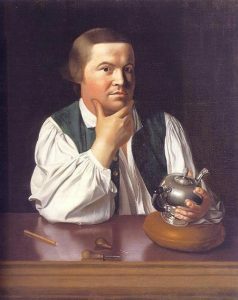 Die stamping machine patented by John Pickering, adapted for inexpensive jewelry in 1777. 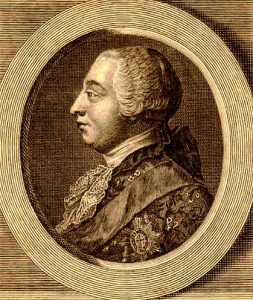 Louis XVI becomes King of France. American Revolution begins, Congress adopts the Declaration of Independence, 1776. Micromosaics first exhibited in Rome. “Caesar’s Ruby” (carved rubellite tourmaline) presented to Catherine the Great of Russia. Azim-ud-Daula, the Nawab of Arcot presents Queen Charlotte of Britain a gift: five diamonds of which two are the Arcots. Burmese jadeite imported into China. 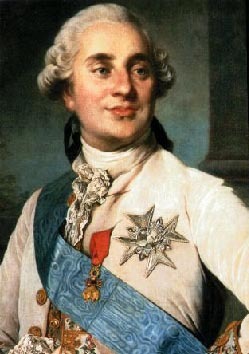 French scientist Antoine Laurent Lavoisier succeeds in melting platinum from its ore using pure oxygen. Spinel first recognized as a distinct mineral. 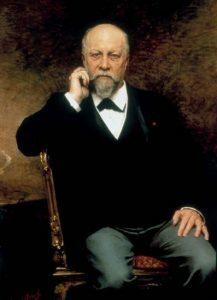 Benedetto Pistrucci is born (dies 1854). 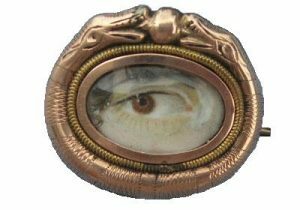 Eye miniatures popularized by Prince George of England. Nizam Ali Kahn of the Deccan presents the Hastings Diamond as a gift to King George III. 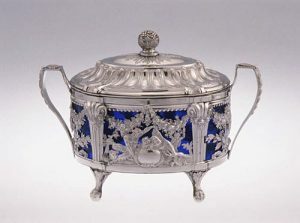 Marc Étienne Janety, goldsmith to Louis XVI of France, crafts a sugar bowl out of platinum. Earliest documented hairwork in U.S.
French Revolution begins, ends 1799. George Washington, elected first President of the USA. He dies in 1799. Chrysoberyl identified as mineral species by German geologist A.G. Werner. Brazilian chrysoberyls in Portuguese jewelry, last ½ 18th C.
Titanium discovered by British clergyman Wm. Gregor, isolated 1910. Seril Dodge of Providence, RI, advertises offering of jewelry items made to order, sells business to half-brother Nehemiah. 1796. Napoleonic Wars. They end in 1815. Amethysts discovered in the Ural Mountains in Russia. 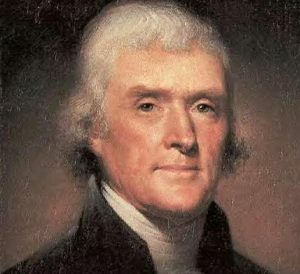 Thomas Jefferson elected President of the USA. Jem Belcher wins his national boxing title. 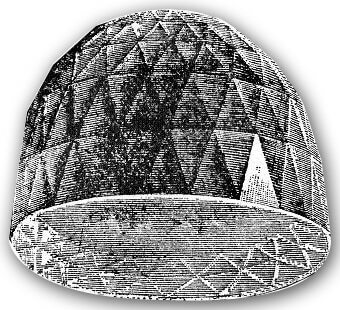 Alessandro Volta invents the first battery, the Volta Pile. Wollaston & Smithson Tennant begin collaboration, create commercial-grade platinum, they discover platinum family of metals: palladium and rhodium in 1802; iridium and osmium, 1803. Robert Hare of Philadelphia invents oxyhydrogen (‘gas’) blowpipe. Niobium discovered by British chemist Charles Hatchett. E. Hinsdale establishes first American factory for the manufacture of fine jewelry in Newark, NJ. 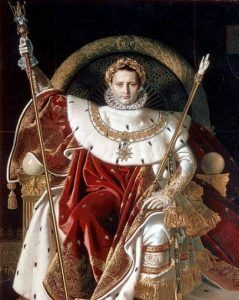 Napoleon crowns himself Emperor of France. 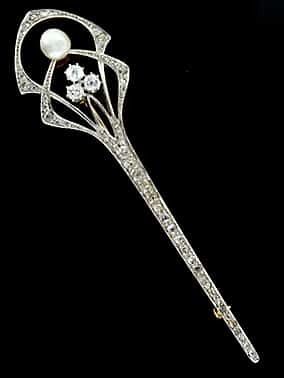 The Regent Diamond is set in Napoleon’s ceremonial sword which he carried to his coronation. Royal Ironworks of Berlin opens, jewelry production starts in 1806. George III declared insane; Regency Period begins in Britain. 1812-1815 War between Great Britain and the USA. 1813-1815 Prussian War of Liberation against Napoleon. 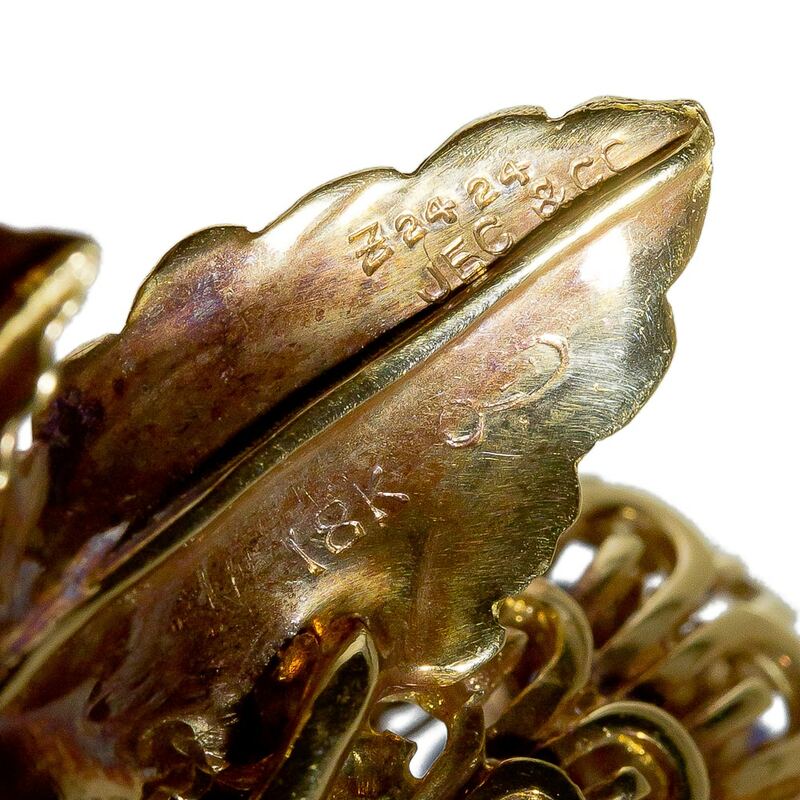 Berlin iron jewelry made in Germany as patriotic gesture during War of Liberation: “ich gab gold für Eisen” (I gave gold for iron). Kingdom of France (Bourbon Dynasty) restored, Louis XVII becomes King. Fortunato Pio Castellani established workshop in Rome, begins study of granulation in ancient gold work in 1827. The Gas Blowpipe by E.D. Clarke is published. George III of Great Britain dies, George IV becomes King. Platinum discovered in Russian Ural mountains. 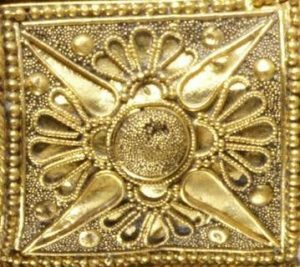 Ancient gold work discovered in Etruscan excavations. Charles X becomes King of France. Pin making machine for straight pins patented in England by L.W. Wright, by J. Howe in the USA in 1832. Andrew Jackson elected President of the USA. Sir Walter Scott’s Anne of Geierstein is published, describing opal as ‘misfortune stone’. French hallmark for doublé d’or (rolled gold) introduced by Paris Mint. 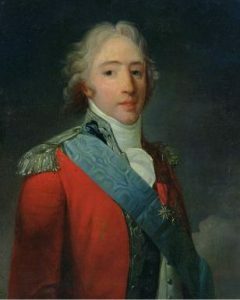 Louis-Philippe I becomes king of France. George IV of Great Britain dies, William IV becomes King. Indian Rubber elastic first appears in Women’s clothing. 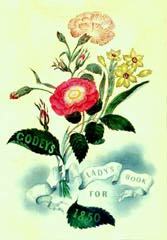 Godey’s Ladies Book first published. Claw/coronet setting of the Middle ages revived. 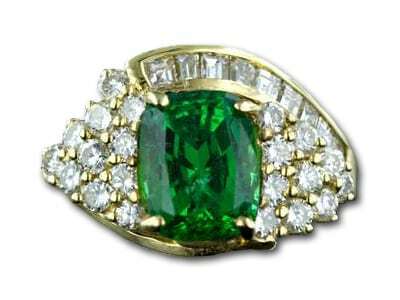 Emerald discovered in Ural Mountains, an important source of emeralds in Europe in the 19th century. Bailey and Kitchen opens shop (Bailey, Banks & Biddle in 1878. Bailey and Kitchen opens shop (Bailey, Banks & Biddle in 1878. Alexandrite discovered in Ural Mountains in an emerald mine, named after Czar Alexander II. USA Patent Act passed. U.S. Patent office issues Patent Number 1. 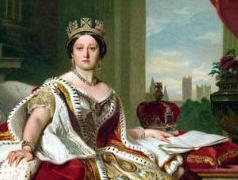 Victoria becomes Queen of Great Britain. Louis J.M. Daguerre perfects daguerreotype photographic process. 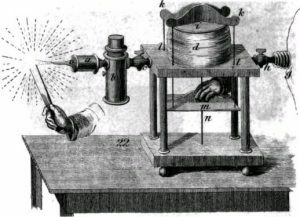 The telegraph is patented by Cooke and Wheatstone, improved by Samuel Morse, first message sent 1844. 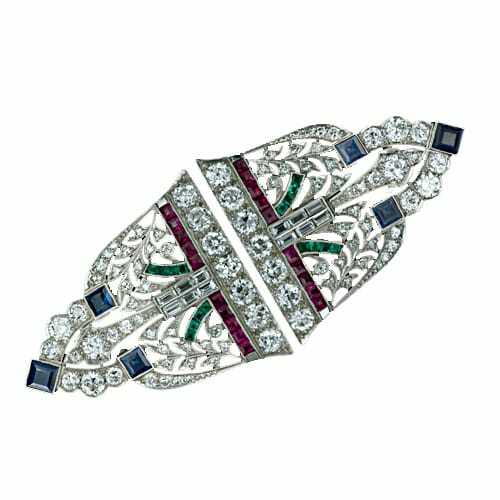 Enameled garter armlet made for Queen Victoria; Order of the Garter strap and buckle motifs become popular. 1853.Falize opens up shop in Paris. 1839 Charles Goodyear invents and patents (1844) vulcanized rubber; displays products at Crystal Palace in 1851. Patek, Czapek & Cie. established by Antoine Norbert de Patek and François Czapek. Victoria weds Prince Albert who introduces a more sentimental Romanticism from a Germanic perspective. Electroplating commercialized, patented by Elkingtons of Birmingham. Large scale jewelry manufacturing begins in the USA. Process for permanently foiled pastes discovered. Steam power first used for diamond cutting in Amsterdam. Repoussé and machine stamping replace cannetille (c.) Scottish motifs in ‘pebble’ (agate) jewelry popularized, continuing through the rest of the century. Algerian Knot Motif introduced in Paris. 1841 Duty on imported jewelry and mounted gemstones levied by USA. 1842 Gutta-percha introduced in Paris. Excavations of ancient Assyrian capital of Nineveh begin. British kite-shaped registry mark introduced. 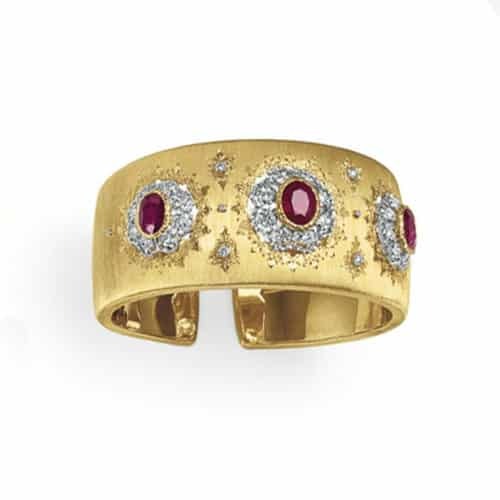 Garrard becomes British Crown Jeweler. Riker, Tay & Searing founded in Newark, NJ, become Riker Bros. in 1892. 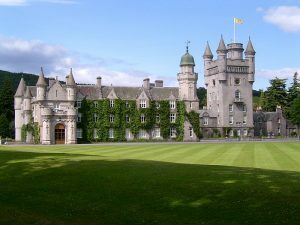 Balmoral Castle in Scotland purchased by Queen Victoria. Thomas H Lowe of Birmingham introduces rolled gold plating process (a.k.a. 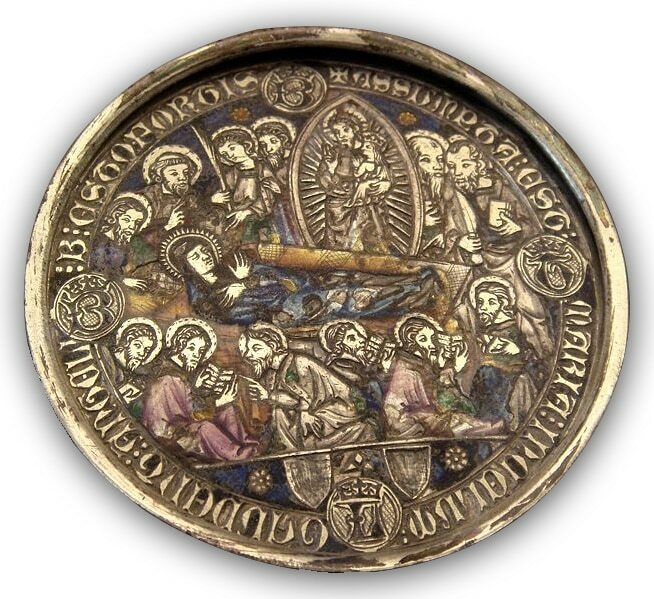 gold filled) to Providence, RI, manufacturers. Caldwell and Bennet becomes J.E. Caldwell & Co., Philadelphia. 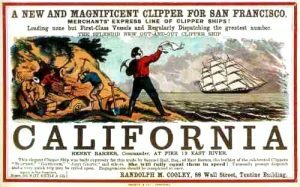 California Gold Rush. The safety pin invented and patented by W. Hunt.Gold electroplating patented.Opals first discovered in Australia, the first with play of color in 1863. High tariff placed on foreign goods imported into the USA. First international exhibition, the Great Exhibition of the Works of Industry of All Nations, held at the Crystal palace in London. Gold and diamonds first discovered in Australia. Hard rubber (vulcanite) patented by Nelson Goodyear. Artificial aventurine (‘goldstone’) exhibited at Crystal Palace. Edward Moore becomes design director of Tiffany & Co..
Louis Napoleon becomes Napoleon III, beginning of the French Second Empire. Machine for heat-pressing bog oak patented. Tiffany & Co. introduces the English sterling standard to the USA. Commodore Matthew Perry sails the American fleet into Japan; opens East-West trade relations. 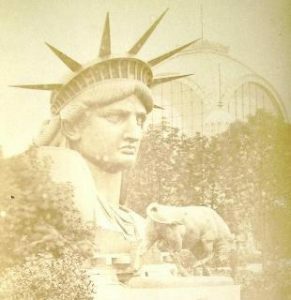 Crystal Palace exhibition held in New York, modeled after London Exhibition. 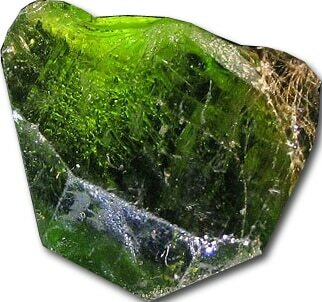 Demantoid garnet discovered in Ural Mountains, identified as green andradite in 1864, named demantoid in 1878. Process for bloomed gold documented. Results of first commercially successful aluminum reduction process published by Henri Ste. Claire Deville. Samuel Peck’s patent for shellac composition daguerreotype cases. 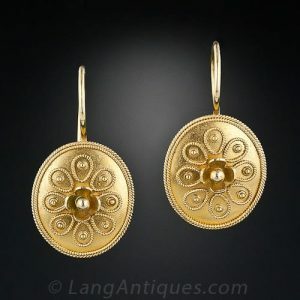 Use of 15-, 12-, and 9-karat gold made legal in England. 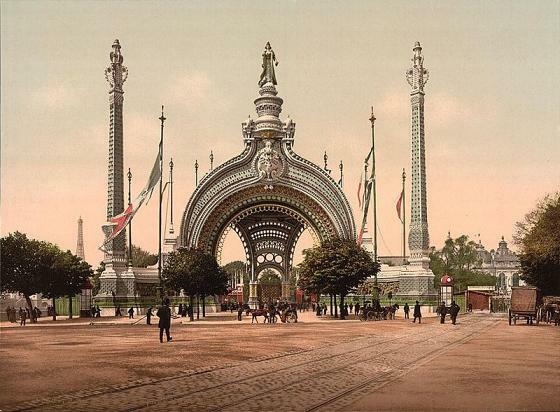 Paris Exposition Universelle, aluminum articles first exhibited. R.W. Bunsen begins using gas-air burner that is his namesake. Patents for Bois durci, Parkesine and artificial coral issued. Theodor Fahrner founds jewelry factory in Pforzheim, Germany. Wm. 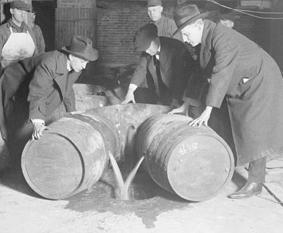 Perkin accidentally discovers the first synthetic aniline (coal-tar) dye, mauve. Financial ‘Panic of 1857’ affects all of U.S. industries. Furnace to melt platinum and it’s alloys developed by Henri Ste. Clair Deville. Snake chain making machine patented in the USA. First attempted laying of a transatlantic cable. 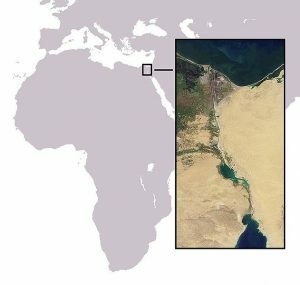 Construction of the Suez Canal begins. Comstock Lode silver discovered in Nevada. Jewels of Queen Ah-Hotep of Egypt discovered. First attempt at organized jewelers’ union in USA, not successful until 1900 (International Jewelry Workers Union of America). English patent for machine to manufacture stamped settings (collets) for stones granted to Frenchmen Bouret and Ferré. Henry D. Morse opens first American diamond-cutting factory in Boston, develops standards for the American round brilliant cut, 1872-75. Emperor Maximilian & Maximilian Diamonds are purchased in Brazil by Emperor Maximilian himself. Ernest Gaillard takes over his father’s workshops in Paris. 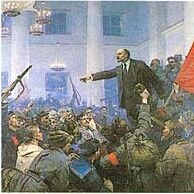 U.S. Civil war begins (1861-1865); Lincoln inaugurated. 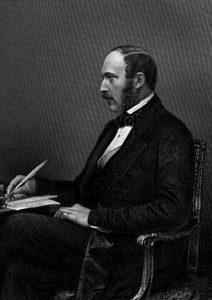 Prince Consort Albert dies; Victoria enters prolonged period of mourning. Fortunato Pio Castellani turns business over to son Augusto. International Exhibition held in London. Japanese decorative arts exhibited for the first time in the West. 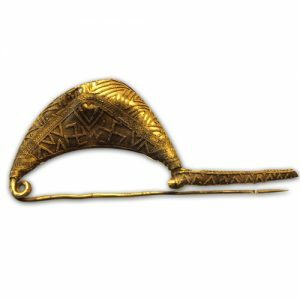 Archaeological revival gold jewelry exhibited by Castellani of Rome at International Exhibition. Edward, Prince of Wales, marries Alexandra of Denmark. Castellani claims to be earliest reviver of plique à jourenamel. Sapphires found in Missouri River in Montana. 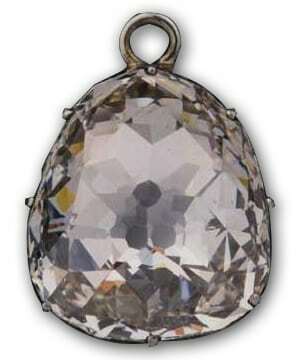 The Idol’s Eye diamond‘s first appearance in recorded history; it is sold by Christie’s in London. Paris International Exhibition. First authenticated diamond, the ‘Eureka’, discovered in South Africa. Exposition, John Brogden wins gold medal for his jewelry. 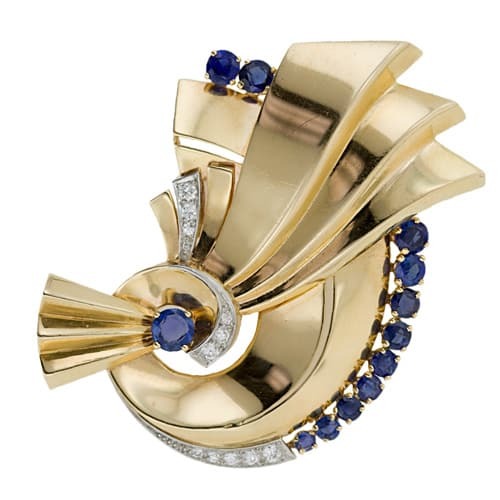 Parisian firm Boucheron begins production of plique à jour enamels. Celluloid, the first successful semi-synthetic thermoplastic, invented in USA by John Wesley Hyatt; commercial production begins in 1873. Gorham Mfg. Co., Providence, RI, adopts sterlingstandard of 925 parts per thousand. First trans-continental railroad from Omaha to San Francisco. Diamond Rush begins in South Africa with the discovery of the Star of Africa. Henry D. Morse cuts the Dewey Diamond, largest found in America to date (23,75ct, cut to 11,70 ct). American Horological Journal first published, merges with The Jewelers’ Circular to become The Jewelers’ Circular and Horological Review. Fall of the French Empire. Start of a recession in Europe that lasts throughout the decade. Diamonds discovered in Kimberley, South Africa. 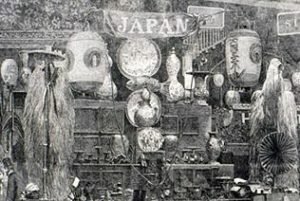 Japanese craftsmen introduce metal-working techniques and designs to the West. Influx of European craftsmen and designers into the USA. Peter Carl Fabergé takes over father’s business. 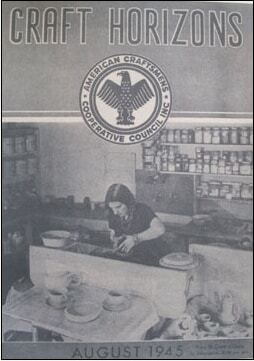 Jewelers’ Circular founded, first issue published February 15. Opals discovered in Queensland, Australia. Ferdinand J Herpers of Newark, NJ, patents six prong setting for diamond, introduced as the Tiffany setting by Tiffany & Co. in 1886. Celluloid commercial production begins; trade name registered, 1873. Universal Exhibition held in Vienna. Henry D. Morse and Charles M. Field obtain British and U.S. (1874, 1876) patents for steam-driven bruting (diamond cutting) machines. Gold discovered in Black Hills of Dakota Territory. Patents for artificial coral, tortoiseshell, amber, jet (celluloid). Giuliano opens up shop in London. Arthur Lazenby Liberty founds Liberty & Co. of London. The Celluloid Mfg. Co. begins jewelry production in Newark, NJ. Centennial Exposition held in Philadelphia. Wearing of swords banned in Japan. 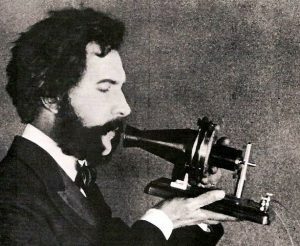 Alexander Graham Bell patents the telephone. Alessandro Castellani presents and lectures on Etruscan revival jewelry at Centennial Exposition. Advent of bottled oxygen (liquefied and compressed). Successful experiments with chemical manufacture of very small rubies and sapphires in Paris, published by Frémy. Aucoc buys Parisian firm ‘Lobjois’ and changes it’s name to ‘La Maison Aucoc’. Patent for platinum-tipped prongs for setting diamonds. Earring covers for diamond earrings patented. 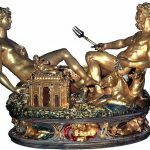 Tiffany & Co. awarded gold medal for encrusted metals technique in the Japanesque style at Paris Exhibition. Unger Bros. of Newark, NJ, begins the manufacture of silver jewelry. T.A. Edison patents incandescent light bulb. Hiddenite, green variety of spodumene, found in North Carolina, USA. Gem expert George Frederick Kunz joins Tiffany & Co. Rational Dress Society founded in Great Britain. Cecil Rhodes establishes De Beers Mining Company in South Africa (renamed De Beers Consolidated Mines in 1888). Mass production of wrist watches begins in Switzerland, introduced in the USA in 1895. Manufacture starts around 1907. Child & Child is established in London. 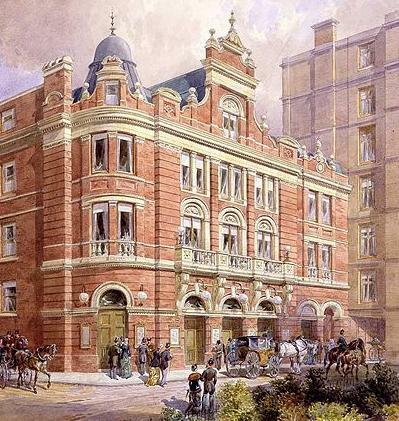 First electrically lit theatre, The Savoy, opens in London. 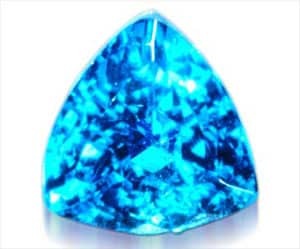 Blue sapphires discovered in Kashmir, N. India. Metropolitan Opera House opens in New York City. Sotirios Bulgari opens up shop in Rome, Italy. First appearance of Geneva synthetic ruby. Carrera y Carrera established. Tiffany setting for diamond solitaires introduced.Richard W. Sears starts a mail order company to sell watches (second company to sell jewelry and watches founded in 1889). Hall-Héroult process for refining aluminum developed; first commercial production in Switzerland, value drops.Celluloid photographic film invented by Hannibal W. Goodwin. Gold extraction by cyanide process Invented by John Stewart, Macarthur and the Forrest brothers. Black opals discovered in NSW, Australia; commercial mining at Lightening Ridge begins in 1903. The Belais brothers of New York begin experimenting with alloys for white gold (c.). David Belais introduces his formula to the trade in 1917 (18k Belais). Tiffany & Co. purchases the French Crown Jewels. Birmingham (England) Jewellers’ and Silversmiths’ Association formed by manufacturers. 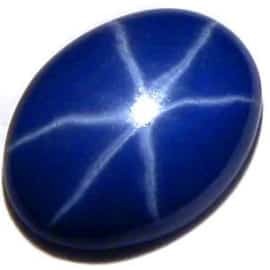 Sapphire’s found in Dry Cottenwood Creek, Montana C.R. Ashbee’s guild of Handicraft founded in London, the first crafts guild to specialize on jewelry making and metalwork. Paris Exposition Universelle – Eiffel Tower constructed. Sapphire’s found in Dry Cottenwood Creek, Montana. 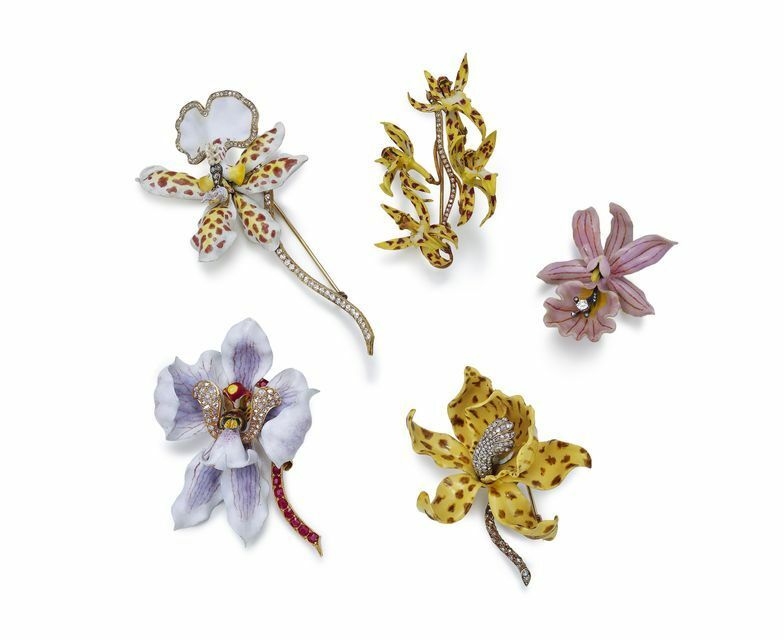 Tiffany & Co. exhibits enameled orchid jewels by Paulding Farnham at the Exposition Universelle. René Boivin establishes Boivin in France. Gibson’s Gibson Girl appears in Life magazine. The marking of foreign imports with the name of the country of origin in English required by the enactment of the McKinley Tariff Act, October, 1890. Patent for artificial horn (celluloid). Frémy publishes experiments with ruby synthesis, drawings of synthetic-set jewelry.Power driven bruting (girdling) machine for cutting diamonds patented in England. First commercial opal mine opened in Australia. Vogue magazine founded in the USA. Marcus & Co. formerly Jaques & Marcus, established in New York. World’s Colombian Exposition in Chicago. Cultured pearls first developed by K. Mikimoto in Japan; first spherical pearls grown 1905.’Platingeld’ introduced, used for simulated gold and platinum chains. Excelsior Diamond is found in South Africa. Thomas Edison’s Kinetoscope Parlor (‘peepshow’) opens in New York City. Screw back earring finding for unpierced ears patented. American Consuelo Vanderbilt marries the British Duke of Marlborough. Blue sapphires discovered in Yogo Gulch, Montana. 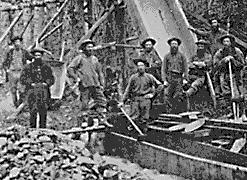 Bonzano Creek Gold Rush in Klondike, Yukon, Canada. The wireless telegraph invented by Guglielmo Marconi (first transatlantic wireless signal in 1901). Sigfried (aka Samuel) Bing opens his new Paris gallery of decorative art called L’Art Nouveau. 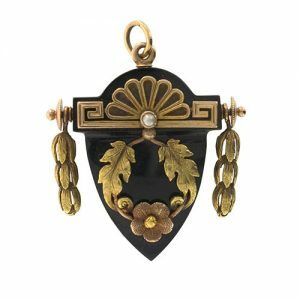 René Lalique exhibits jewelry at the Bing gallery and the Salon of the Societé des Artistes Français; begins work on a series of 145 pieces for Calouste Gulbenkian. Daniel Swarowski opens Glass stone-cutting factory in Tirol, Austria. 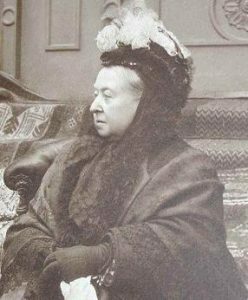 Queen Victoria‘s Diamond Jubilee. Casein plastics marketed in Germany. Boston and Chicago Arts and Crafts Societies founded. Lacloche Frères established in Paris. Commercial sapphire mining begins in Rock Creek, Montana. Commercial tourmaline mining begins in San Diego County CA. Boer war in South Africa starts, lasts until 1902. Diamond supplies curtailed by the Boer war, prices for De Beers’ reserve stock rise. Oxyacetylene torch invented by Edmund Fouché. Synthetic rubies exhibited at Paris Exposition. Tiffany & Co. exhibits a life size iris corsage ornament set with Montana blue sapphires. 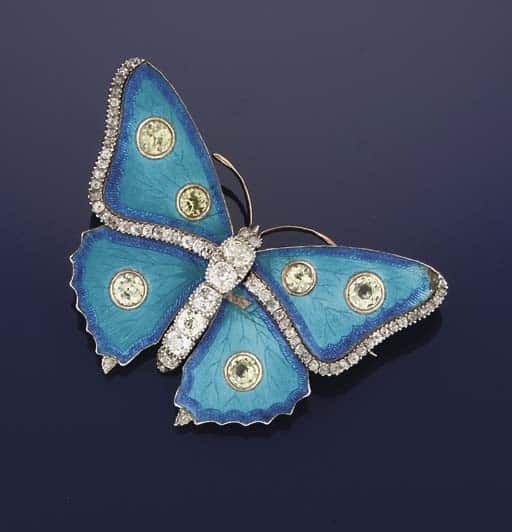 Boucheron, Fouquet, Lalique, Vever and other French jewelers display their Art Nouveau jewels at the Paris exposition. The Kalo Shop founded by Clara Barck Welles in Chicago,IL begins jewelry making in 1905, closed in 1970. USA officially adopts the gold standard with McKinley’s signing of the Gold Standard Act. 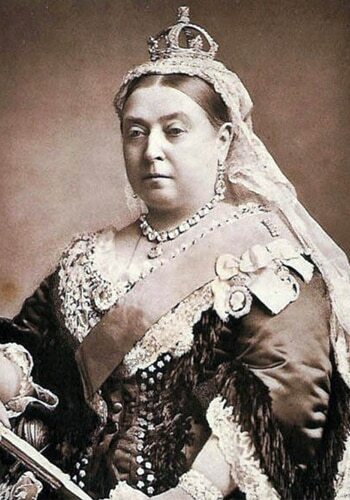 Queen Victoria dies, Edward VII becomes King. McKinley assassinated. 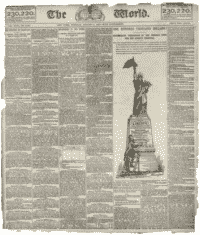 Theodore Roosevelt becomes President. Pan American Exposition held in Buffalo NY. Lever safety catch for brooches patented by Herpers Brothers of Newark..
Gustav Stickley begins publishing his periodical, The Craftsman (until 1916). 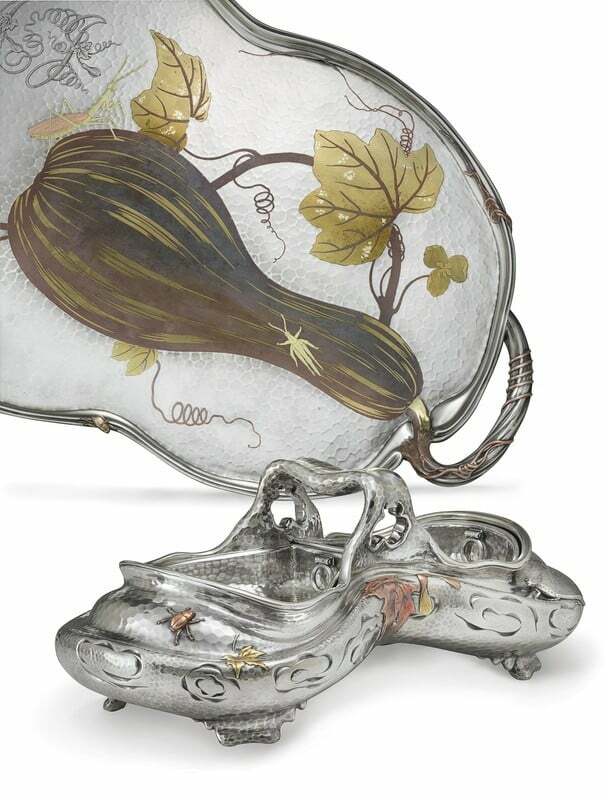 Tiffany & Co. exhibits at Pan-American Exposition, special hallmark (beaver) used on exhibition pieces. Flame fusion process for synthesizing rubies presented in Paris by Verneuil, published and patented in 1904. Pink variety of spodumene, kunzite, discovered in California, identified by and named after George Frederick Kunz. Process for setting Rhinestones or metal in celluloid patented. Joseph Asscher develops the Asscher cut for diamonds. 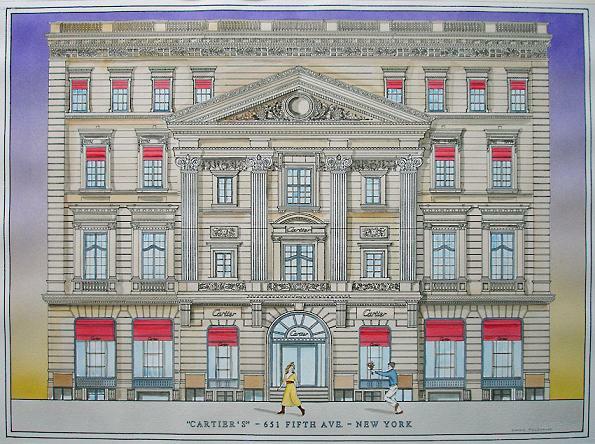 Cartier opens a London branch. Black opals commercially mined at Lightning Ridge, NSW, Australia. Wiener Werkstätte founded in Vienna, Austria by Koloman Moser and Josef Hoffman. Fabergé opens London branch, selling mostly ‘gentleman’s rings’. Louisiana Purchase Exposition held in St. Louis. New York City subway opens. Construction on the Panama Canal begins. 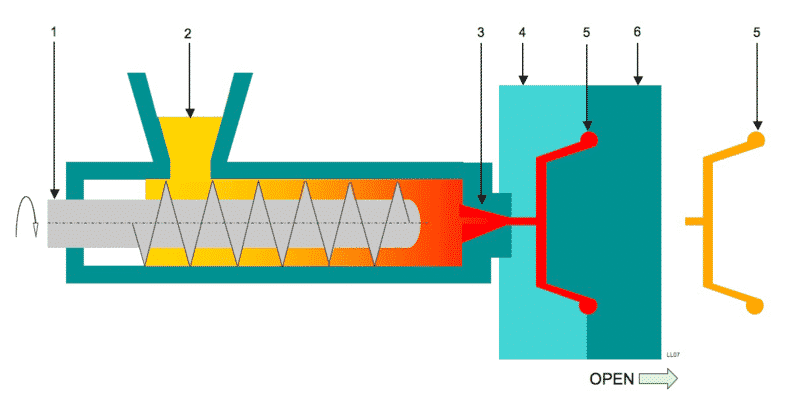 Verneuil publishes & patents flame fusion process. 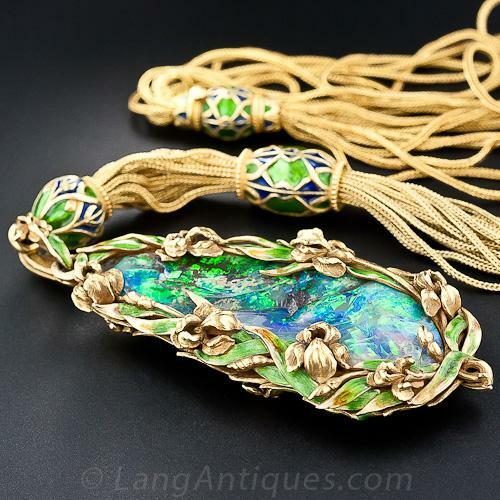 Louis Comfort Tiffany exhibits his jewelry for the first time at the St. Louis Exposition. Marshall Field & Co. Chicago, establishes a craft shop for jewelry and metal ware (closed 1950). Georg Jensen opens his silver-smithy in Copenhagen, Denmark. Albert Einstein proposes his theory of relativity. First spherical pearls grown in Japan by Mikimoto. Cullinan diamond discovered in South Africa, presented to Edward VII on 1907. Forest Craft Guild founded by Forest Mann in Grand Rapids, MI, USA. The Kalo Shop begins jewelry making in Chicago. Henri Matisse and other fauvist artists exhibit at Salon d’Automne in Paris. San Francisco earthquake and fire. Finland is the first country to grant women’s suffrage. National Stamping Act passed in the USA, requiring marking of gold and silver content. 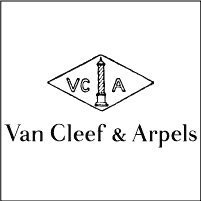 Van Cleef & Arpels founded in Paris. Suffragettes demonstrate for the right to vote in London. Benitoite discovered in California, declared official state stone in 1985. First exhibition of cubist paintings held in Paris, including works by Pablo Picasso and Georges Braque. Tiffany & Co. establishes Art Jewelry Dept. 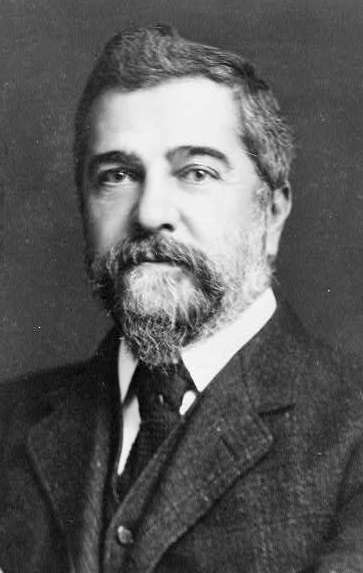 with Louis Comfort Tiffany as director. First spherical cultured pearls patented by Mikimoto (first grown in 1905, American patent granted in 1916). Synthetic spinel accidentally produced by flame fusion process. Henry Ford introduces the first mass-produced automobile, the Model T.
Couturier Paul Poiret opens ‘Boutique Chichi’, introduces corset less dresses and the vertical line in fashion (c.). A British gemology course is the result of the annual meeting of the National Association of Goldsmiths of Great Britain and Ireland. First course: 1912, first diploma 1913. Copyright symbol © introduced for printed works. Leo H. Baekeland patents first entirely synthesized plastic, Bakelite. The Wright brothers begin large scale manufacture of the airplane (first flight 1903, patented in 1906. Synthetic color change corundum first created. Edward VII dies, George V becomes king of Great Britain. First major American women’s suffrage parade held in New York City, demonstration in Washington DC in 1913. 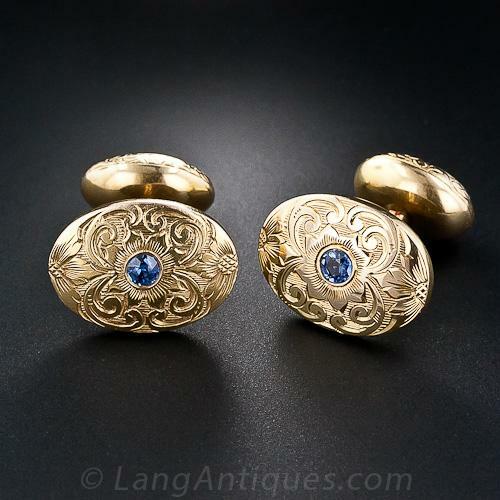 Eugene Morehouse invents the ‘bullet’ safety catch for brooches, patented for B.A. Ballou & Co. in 1911. France classifies platinum as a precious metal, new hallmark (dog’s head) issued in 1912. Suffragette jewelry in green, white and violet (first initials for ‘give women votes’) is popular in Britain and the USA. 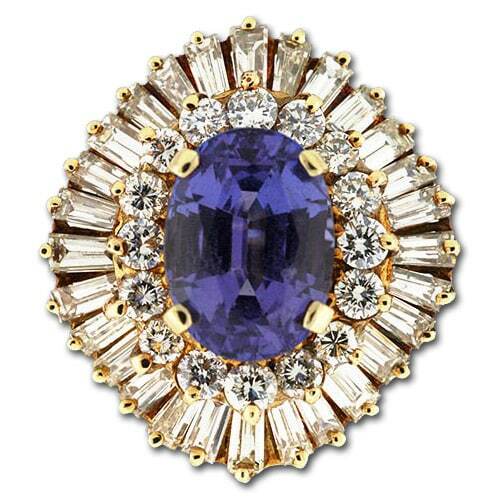 Synthetic blue sapphires are patented in the USA by Verneuil. The Hope Diamond is purchased by Ned and Evalyn Walsh McLean. George V has Cullinan I and II set in Imperial State crown and scepters. Cartier introduces the baguette cut for diamonds. Oscar Heyman & Bros. founded in New York. New hallmark for platinum (dog’s head) issued. First ship though Panama Canal, completed in 1913. The first U.S. fashion show is staged by Edna Wollman Chase, editor of Vogue. Platinum is declared a ‘strategic metal’ during wartime, use in jewelry diminished. Panama-Pacific Exposition held in San Francisco. Panama-California Exposition held in San Diego. U.S. patent #1165448 granted to Karl Richter of Pforzheim, Germany, for a white gold alloy of gold, nickel and palladium. The first U.S. fashion show is staged by Edna Wollman Chase, editor of Vogue. The USA enters the War. David Belais of New York introduces his formula for 18k white gold to the trade, known as 18k Belais. Cartier designs the Tank wristwatch, first public sale 1919. Bohemia, Moravia and Slovakia become the Republic of Czechoslovakia. First regular airmail service, between Washington DC and New York City begins, New York to San Francisco in 1921. Polish chemist J. Czochralski’s “pulling” method for gemstone synthesis is published. Marcel Tolkowsky publishes Diamond Design, detailing the cut and proportions of the modern brilliant (‘American’ or ‘Ideal’ Cut), following scientific standards first discovered and developed by Henry D. Morse. The Nineteenth Amendment is ratified, giving women the right to vote. 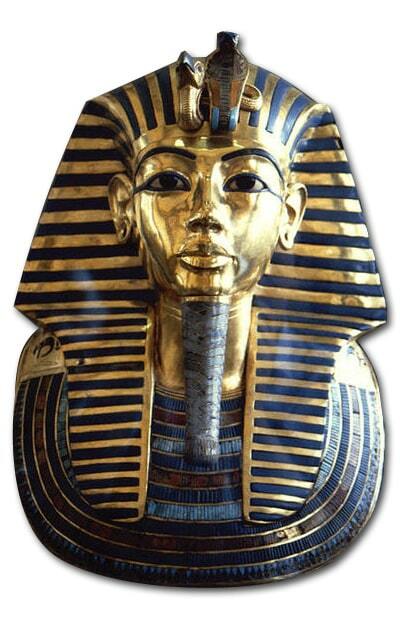 Howard Carter discovers King Tutankhamen’s tomb in Egypt. Yard. founded in New York City. Synthetic pearl essence for simulated pearls invented, called H-scale. Egyptologist Caroline R Williams discovers the granulation technique used by ancient goldsmiths. Exposition Internationale des Arts Decoratifs et Industriels Modernes is held in Paris. 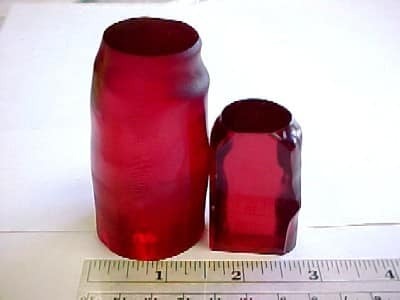 Synthetic spinel, inadvertently produced by flame fusion process in 1908, now in worldwide use. 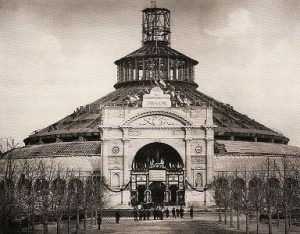 Jensen is awarded the Grand Prize at the Paris exposition. Firm of Trifari, Krussman & Fishel established. The first injection molding machine patented by Eckert and Ziegler in Germany. Charles Lindbergh flies solo nonstop New York to Paris. Motion picture with sound first publicly shown (Al Jolson in ‘the Jazz Singer’). Cellulose acetate, trade name Lumarith, introduced by Celluloid Corp.
Schiaparelli establishes ‘Maison Schiaparelli’ in Paris. Paul Flato opens salon in New York. 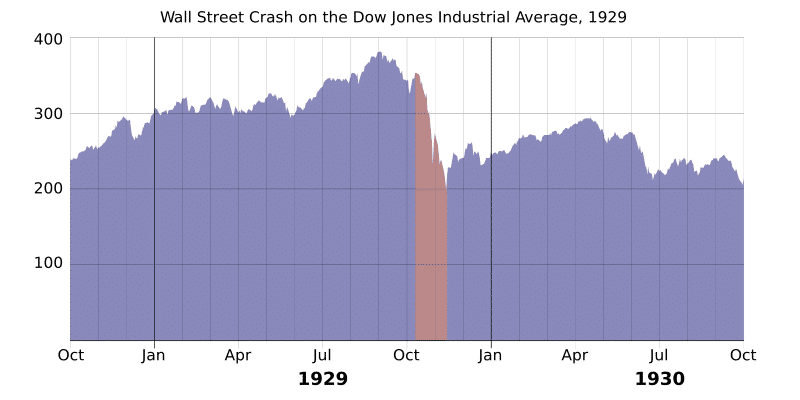 The Great Depression begins with stock market crash. Trabert & Hoeffer-Mauboussin merger agreement. Black, Starr & Frost merger with Gorham Corp., until 1966. Chrysler Building completed in NYC. Ernest Oppenheimer becomes chairman of De Beers, creates Diamond Corporation. Formation of Union des Artistes Modernes, Paris. Empire State building becomes New York’s tallest. 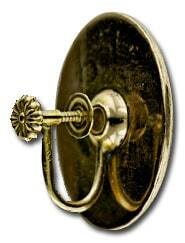 The ‘Duette’ pin back mechanism for double clip brooches patented by U.S. costume jewelry manufacturer Coro. William Spratling opens the first silver workshop in Taxco, Mexico. Robert M. Shipley founds the GIA. 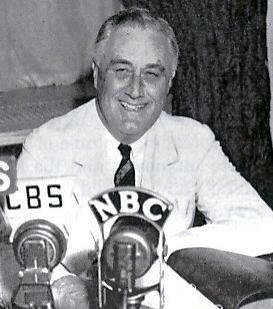 Franklin D. Roosevelt elected President of the USA. 14k gold replaces 12k and 15k in Britain, by decision of the Worshipful Company of Goldsmiths, London. Harry Winston opens a retail jewelry business in New York City. Construction begins on Golden Gate Bridge in San Francisco (completed in 1937). Gold taken out of circulation. Century of Progress World Fair opens in Chicago. The invisible setting (serti invisible) patented by Cartierand Van Cleef & Arpels (introduced in USA in 1936). Diamond Producers Association formed, Diamond Trading Co. created. Salvador Dali exhibits surrealist paintings in New York City. Synthetic emeralds (Igmerald) developed by IG-Farben, Germany, first seen by gemologists. Patent for the clip back earring finding for unpierced ears granted to Eugene Morehouse for B.A. Ballou. Ernest Oppenheimer creates the De Beers Consolidated Mines Ltd. diamond cartel. Van Cleef & Arpels introduces the “Ludo Flexible Strap Bracelet”. French luxury cruise ship Normandie arrives in New York. U.S. Works Progress Administration inaugurated. D. Lisner & Co. introduces ‘Bois Glacé’ jewelry, their trade name for colorless phenolic plastic (Bakelite) laminated to wood. The Jewelers’ Circular merges with The Keystone to become Jewelers’ Circular-Keystone. George V dies, succeeded by George VI. BBC inaugurates television service; general broadcasting begins in U.S. in 1941. Life Magazine founded by Henry Robinson Luce. Invisible setting (serti invisible) introduced by Van Cleef & Arpels. The International Exhibition of Arts and Techniques in Modern Life held in Paris. First feature-length animated film, Walt Disney’s ‘Snow White and the Seven Dwarfs’. Du Pont de Nemours & Co. introduces acrylic plastic, trade name ‘Lucite’; also patents nylon fiber. Van Cleef and Arpels makes ‘marriage contract’ bracelet for Wallis Simpson, the Duchess of Windsor. Boucheron, Cartier, Mauboussin, Van Cleef & Arpels and others display figural jewels of colored gold and gemstones at Paris exposition. Paul Flato opens his Los Angeles establishment. World War II begins in Europe. The New York World’s Fair, titled ‘The World Of Tomorrow’ opens. Gone With The Wind premiers. First commercially successful synthetic emerald process marketed by Carroll Chatham of San Francisco, CA (the term ‘Chatham Created Emerald’ first used in 1963). The House of Jewels at the New York World´s fair is sponsored by Tiffany & Co., Black, Starr & Frost-Gorham, Udall & Ballou, Marcus & Co. and Cartier New York. Van Cleef & Arpels opens an office in New York. 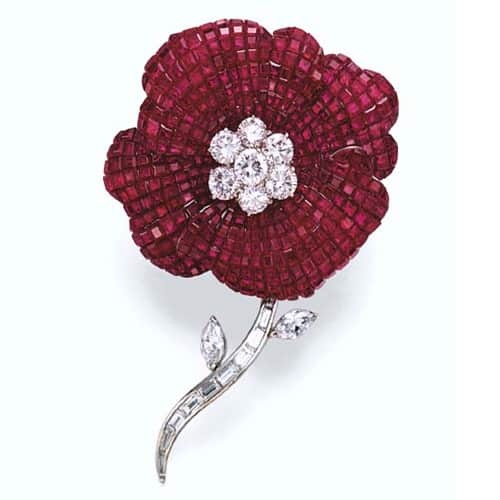 Verdura opens his shop in New York. Sam Kramer opens his shop in Greenwich Village. France falls under German occupation. Hydrothermal synthetic quartz produced by AT&T Bell Labs, USA. The Bank of France bans all gold trading. The Greek Lalaounis, at age 20, becomes an apprentice at Zolotas in Athens. The USA enters the War with the Japanese bombing of Pearl Harbor. 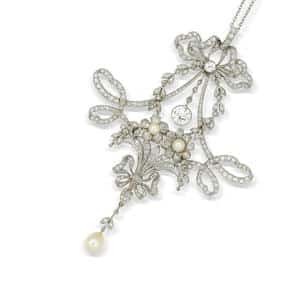 10% luxury tax on jewelry in USA raised to 20% in 1944. Jean Schlumberger opens shop in New York, Joins Tiffany & Co. in 1956. Craft Horizons, the first national magazine for crafts in the USA is published by the Handicraft Cooperative League. Rationing of consumer products (sugar, coffee, gasoline) begins in the U.S. Polyethylene formulated by Earl S. Tupper and DuPont, Tupperware introduced in 1946. Use of platinum for jewelry prohibited in USA. White metal restricted by U.S. Government, sterling silver used as substitute in costume jewelry. Postal zones added to addresses of large cities in USA. Luxury tax on jewelry raised to 20% in the USA. Sugilite discovered by Ken-ichi Sugi. Roosevelt dies, Harry Truman becomes President of the USA. 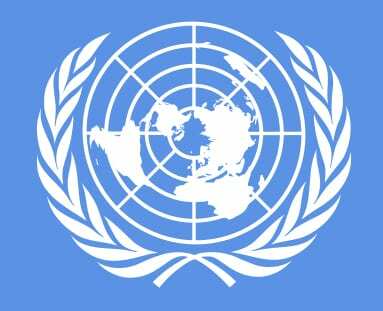 United Nations is formed, holds first session in 1946. Suzanne Belperron forms partnership Herz-Belperron with Jean Herz in Paris. Mexican government requires marking of sterling silver with ‘spread eagle’ assay mark. 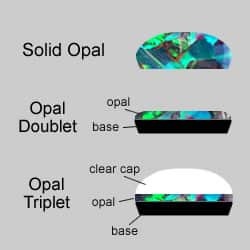 Opal doublets first made in Australia, triplets around 1960. First National exhibit of American studio artists’ jewelry held at Museum of Modern Art in New York City. Jerry Fels founds ‘Renoir of Hollywood’ in Los Angeles, CA. Couturier Christian Dior introduces ‘The New Look’. Copyright laws re-enacted by U.S. Congress, expanded to include illustrations of merchandise and designs for art works. Synthetic star corundum becomes available, production by Linde from the USA. 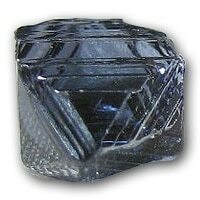 Synthetic Rutile introduced as a diamond simulant. Synthetic star rubies and sapphires (Linde) first marketed. Costume jewelry manufacturers begin abandoning design patents in favor of copyrights, using the © as part of a maker’s mark. Metalsmithing workshops series for war veterans begins, ends in 1951. Jewish State of Israel declared, admitted to U.N. in 1949. Truman elected to full term as President of the USA. De Beers Diamond Corp. launches the slogan ‘a diamond is forever’. German Federal Republic (West Germany) proclaimed. 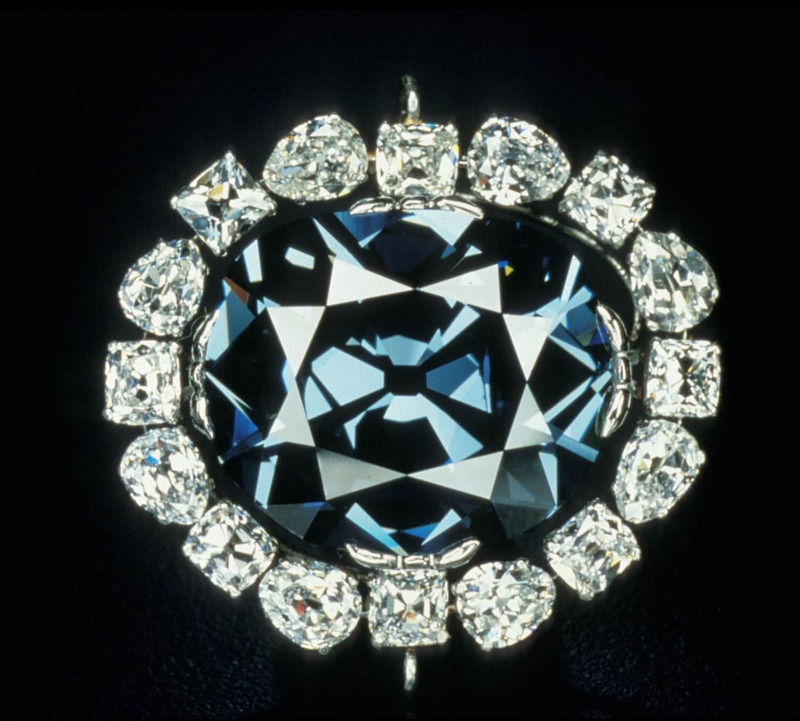 Harry Winston purchases the Hope Diamond. his ‘Court of Jewels’ exhibit opens in New York, it tours the USA for the next four years. Marshall Field closes craft shop for jewelry & metalware. Color television introduced in the USA. The Metal Arts Guild organized in San Francisco. George VI of Britain dies; succeeded by Elizabeth II. Dwight D. Eisenhower elected President of the USA. Strontium Titanite is introduced as a diamond simulant. Italian Jeweler Buccellati establishes a salon in New York City. Marilyn Monroe sings ‘Diamonds Are a Girl’s Best Friend’ in ‘gentlemen Prefer Blondes’. Mamie Eisenhower wears Trifari faux pearls to Inaugural Ball. 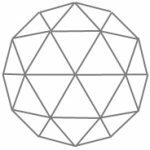 De Beers institutes the Annual Diamond International Awards for original designs in diamond-set jewelry. First successful production of synthetic diamonds at General Electric, process patented in 1960, large gem-quality crystals produced in 1970. 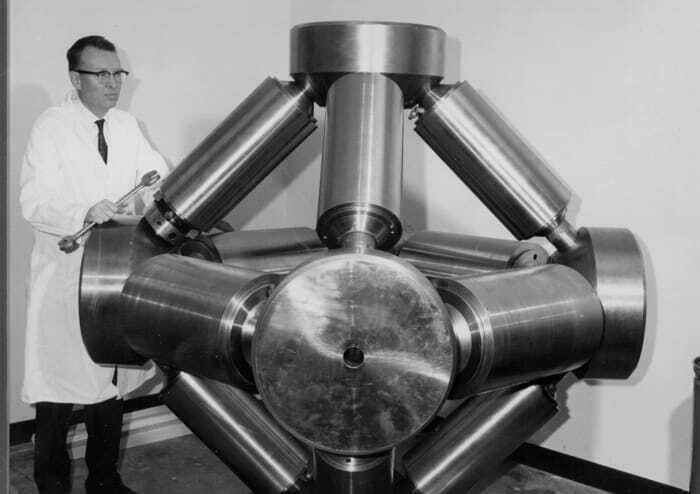 Atomically generated power first used in the USA. Swarovski Corp introduces the ‘Aurelia Borealis’ color effect for rhinestone and crystal in collaboration with Cristian Dior. Strontium Titanite introduced to the public as a diamond simulant. Julius Cohen opens up his jewelry salon. 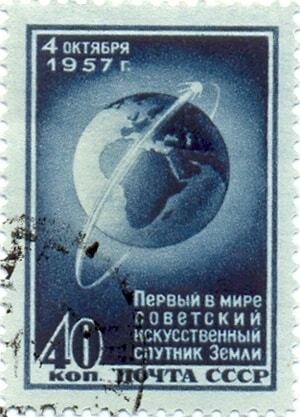 USSR launches first ‘Sputnik’ satellite on Oct. 4. Universal Exhibition opens in Brussels, Belgium. 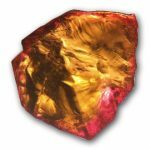 Chatham introduces Flux Melt Synthetic Ruby. John F. Kennedy elected President of the USA. Birth control pills introduced to the public. Process for synthetic diamonds patented in the USA. Synthetic overgrowth of emerald on goshenite successful: Leichleitner emeralds enter the market in small numbers. 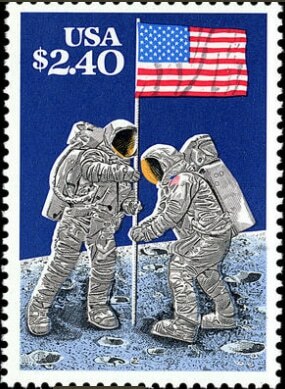 Both the Soviets and the USA put the first men in space. International Exhibition of Modern Jewelry (1890-1961) held in London. U.S. National Stamping Act amended, requiring a maker’s trademark. Laurence Graff opens up his first shop in Hatton Garden, London. Kennedy assassinated. Lyndon Johnson becomes President. U.S. Post Office introduces the ZIP code. 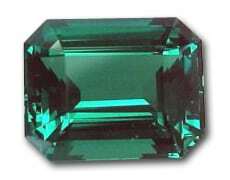 The term: Chatham Created Emerald first used. David Webb opens salon in NY. Vietnam War begins. Commercial production of Gilson Flux melt Emeralds starts. Black, Starr & Frost ends merger with Gorham Corp.
Cubic Zirconia skull melt process patented, CZs commercially marketed in 1976. Gilson produces synthetic opal and synthetic turquoise. 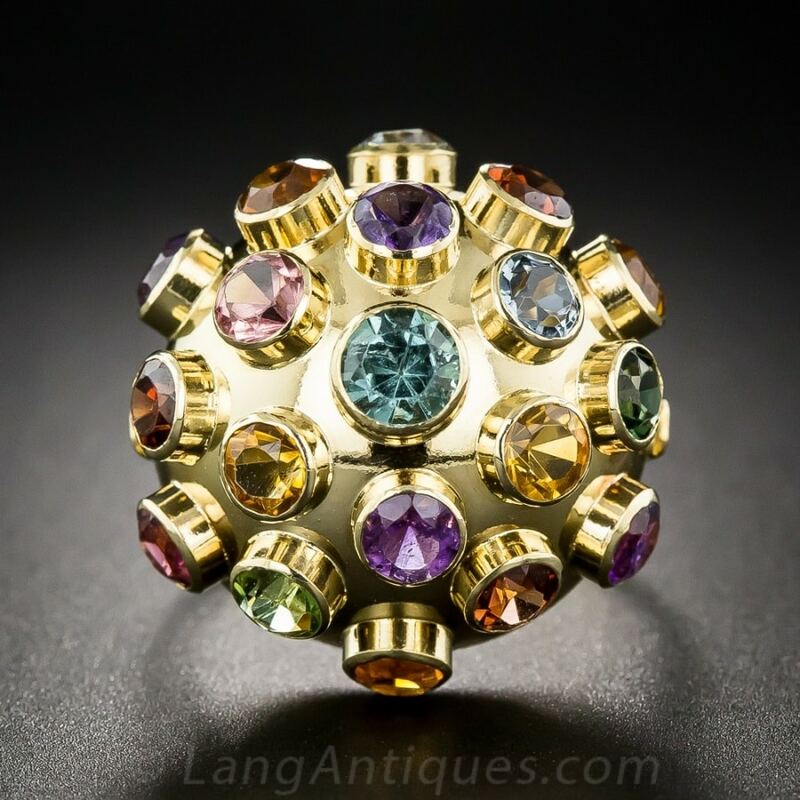 Synthetic alexandrite first marketed by Creative Crystals from the USA. Nixon resigns as a result of Watergate (1973). Synthetic citrine (hydrothermal) becomes commercially available. Chatham introduces flux melt synthetic blue sapphire. Tsavorite garnet discovered in Kenya. Synthetic amethyst (hydrothermal) becomes commercially available. Apple II personal computer, 1977. CZ commercially marketed. National Stamping Act amendment introduces the marking of plumb gold (e.g. 14 KP) meaning exact (no tolerance). Joel Arthur Rosenthal discreetly opens JAR with his partner Pierre Jeannet. Marina Bulgari opens her own store in Milan: Marina B., another in New York City in 1986. 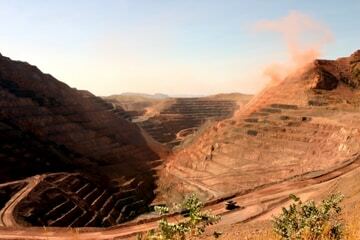 Main pipe of the Argyle Diamond Mine in Australia discovered, mining company commissioned in 1985. 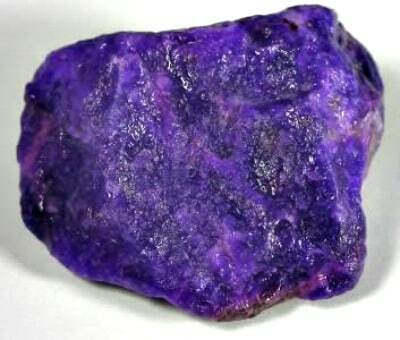 Sugilite, named after Professor Ken-ichi Sugi, begins appearing on the market (discovered 1944). Gem quality red beryls in Wah Wah Mountains, Utah. De Beers and Sumimoto start synthetic diamond production. Tourmalines discovered in Paraíba Brazil. Flux melt spinel becomes commercially available. Synthetic forsterite is produced as a peridot simulant by Mitsui Mining, Japan. 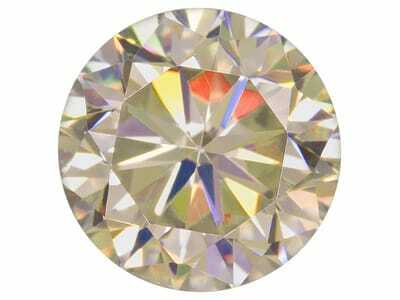 Sythetic moissanite become commercially available, produced by C3 Inc. USA.